What Can You Drink At Night To Help You Lose Weight? Make One Of These 4 Drinks At Home And Drink Before Bed To Fall Asleep, Stay Asleep And Burn Fat While You Sleep! One cannot deny the fact that that obesity has reached epidemic levels in the US. You only need to walk down any American street and you will find that as many as 75 percent of the people are overweight – meaning 2 out of every 3 people! And what’s alarming, as per the National Institutes of Health (NIH), 33 percent of these people are obese. But, what the most people don’t know, however, is that insomnia and other sleep disturbances are so widespread that they too have reached epidemic levels. According to Bridget Murphy, R.D.N., C.D.N., at NYU Langone Medical Center poor sleep is closely related to weight gain, skewed hormone levels, next-day munchies, and blood sugar and insulin problems. As per the Centers for Disease Control and Prevention (CDC), approximately 50-70 million US adults have sleep or wakefulness disorders. This translates to about 1 in 3 American adults that are not getting enough sleep on a regular basis (source). Interestingly, this is about the same percentage of people who suffer from obesity. Whereas, you might be aware that having caffeine and sugar too close to bedtime can mess with your sleep, there are some nutrients that can in fact help you gain muscles, improve your blood sugar stability, and burn fat. Read here for How to lose belly fat fast. We spoke to many experts to find out some ways, which can tackle both issues, the insomnia as well as losing weight, all while you sleep? Well, here is the secret! These 4 bedtime fat-burning drinks have several natural ingredients that will improve your metabolism, help you relax and moreover keep you feeling full so as to stop you munching snacks before you sleep at night — the most common cause that makes you overweight or even obese. Psyllium can help weight loss in a number of ways. Apple juice makes the drink naturally sweet and tasty, and, with a sprinkling of cinnamon, you get the feeling of drinking an apple pie, but without all the calories and other bad stuff in it. (i) Psyllium husk is an edible soluble fiber and prebiotic. Once ingested, psyllium expands to form a gel-like mass by drawing water in from your colon. The mucilage in the husk acts as a lubricator, helping the food in the digestive tract move forward faster and effortlessly; consequently it helps to move waste out of your colon more quickly and efficiently. It reduces fat absorption from the intestine. The bulking up of stomach contents provides a feeling of fullness that discourages snacking. Apple juice drink at night may go against the weight loss recommendation to avoid fruits in the latter part of the day, but taken with psyllium, which reduces absorption of nutrients, it shouldn’t do any harm. The pectin in the apple can further limit the absorption of fat from the guts and make it easier for your body to break down fats into fatty acids. The antioxidants in the fruit, especially quercetin, can help reduce oxidative damage and associated inflammation. This spice is well known for its blood sugar-regulating effect. Its nighttime dose also boosts your metabolism and even helps to increase belly fat burn when the body is otherwise at its lowest energy requirement. (i) Cut up the apple with the skin on and blend it with water until smooth. (ii) Pour the mixture into a large cup and stir in psyllium husk and cinnamon powder. (iii) Drink immediately, otherwise, the husk will thicken the drink too much. (iv) Drink another glass of plain water immediately after you finish the apple drink. Note: Psyllium husk may reduce the absorption of medications and nutrients in foods, so avoid the drink within 2 hours of taking drugs and meals. 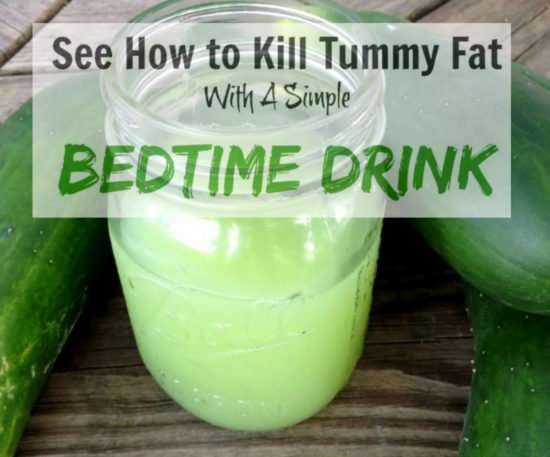 This nighttime beverage can help you not only reduce the swelling of your stomach, but also to lose weight in the area of the stomach that is always so critiqued. This acidic fruit contains ascorbic acid that improves digestion, helps foods be broken down easily, and nutrients to be properly absorbed. Its pepsin component also helps you benefit more from proteins by burning fat. It gives you a satisfying feeling, prevents gas, and burns fat. It works as an effective metabolic stimulant for any diet. This low-calorie vegetable is super rich in soluble fiber, which binds with the fatty acids. Thus, It helps to get rid of them so as to reduce the total fat intake from your digestive tract. Cucumbers are a great diuretic, which facilitates the elimination of fluids. They also work as a powerful detoxifier. Moreover, they are useful for treating infections like cystitis and nephritis; diseases that also tend to make your stomach get bloated. Like lemons, cucumbers are one of the best alkaline foods, so counteract the effects of an acidic diet and can further help balance your body’s pH level. Ginger is most widely known for its powerful digestive properties. It is a great anti-inflammatory and has an incredible ingredient known as gingerol. This ingredient boosts functioning of the intestines and stomach, helps digestion, prevents gas and inflammation, and accelerates elimination of fat. If you combine it with the other elements like the ones listed here, you will get an ideal remedy to get a flat belly. (i) Blend cucumber and grated ginger with water until smooth. This tasty combination of warm milk, honey, and a sprinkling of nutmeg is your ticket into Snooze fast. (i) Despite common belief that whole milk is fattening, a 2013 study report published in the European Journal of Nutrition reports that 11 out of 16 studies prove it is not. In fact, regular consumption of milk may actually help prevent weight gain. Nutmeg is a popular home remedy for insomnia, especially in warm milk. (i) It’s packed with magnesium, an essential mineral your body requires to reduce nerve tension. It also promotes the release of serotonin, which is converted to melatonin in your brain to induce sleep. (ii) Nutmeg in fact has trace elements of narcotics that can help release various neurotransmitters that induce relaxation and sleep. (iii) Nutmeg also contains a known thermogenic effect that help fires up your metabolism to burn extra fat while you sleep. Caution: Nutmeg is a quite strong spice-so much so that it’s very possible to “overdose” and end up feeling incredibly ill, hallucinating, and experiencing many other uncomfortable side effects. Though, ingested safely it is a pretty darn good natural sleep-aid, thanks to numerous chemical components that act similar to tranquilizers-just stick to a quarter teaspoon or less. (i) Full-Fat Milk: 1 cup, preferably cow’s. (i) Heat the milk until it’s a little hotter than you would comfortably drink, and stir in the honey. Cool it until tepid. (ii) Sprinkle the ground or grated nutmeg. Your nice, foamy night-drink is ready. Drink it immediately. Tip: Make this at least half an hour before bed when you start winding down, sip slowly, and enjoy, so you’re not waking up in the night to run to the bathroom! While diet and exercise are the tried-and-true ways to trim your middle, recent study shows that tart cherries and aloe vera drink may be of some assistance. Studies show that tart cherry juice produces significant reductions in insomnia severity. Another study even shows that it can increase melatonin levels, which is the hormone regulating sleep-wake cycle. So, it can improve your sleep duration and quality. Tart cherry juice is anti-inflammatory too, so it helps reduce water retention. It has the potential to reduce fat deposits in the body, especially the area of abdominal fat. Laboratory studies and clinical studies in prediabetic and obese diabetic patients support this observation. (i) Tart cherry juice: 2-4 oz. (ii) Aloe Vera juice: 1 oz. (i) Mix the Aloe Vera juice and cherry juice in an 8-oz. glass and top it up with cold water. (ii) Mix well and enjoy this one of the best sleepy drinks. (i) Aloe acts as a laxative so be careful how much you drink. (ii) Tart cherry juice is a more concentrated source of calories than the fruit, and without the fiber of fruit, it’s also not as filling. Limit your intake to 4 ounces of juice a day to aid in overall calorie control. Remember that in order to lose weight and keep it off, one needs to focus on healthy eating, regular exercise, and a healthy lifestyle. These bedtime drinks may also help promote weight loss; however one should never solely rely on these drinks to lose weight. Previous articleSenior Fitness – What And When To Exercise? The Cucumber Lemon Ginger Drink sounds good!